Ideal for cleaning around door jambs, body trim, badges, grills, wheels, lug nuts, engine bays, cupholders, etc. The Chemical Guys 1-inch Boar 's Hair Detail Brush is truly the “Best Detailing Brush” you will ever buy. Chemical Guys designed and developed the full synthetic brush with the detailer in mind, and perfected it to a premium level. The Best Detailing Brush delivers the durability, accuracy, precision, and versatility needed to clean the filthiest, most delicate, and hardest to reach surfaces, nooks, and crannies. Genuine boar 's hair bristles ensure no surface, including paint, get scratched or marred while you clean. The durable all-natural hairs are chemical resistant and work with every Chemical Guys cleaner and degreaser. Easily clean brake calipers, wheel crevices, emblems, grilles and grates, buttons, cupholders, and engine components with the Best Detailing Brush. The thin profile and long handle makes it easy to clean any interior or exterior spots where dust and grime collect and hide. The bright plastic handle and ferrule construction removes any metal from the equation, saving sensitive surfaces from scratches and the brush from rusting over time. When dirt, grease, and grime give you a hard time, scrub them away for easy cleaning with The Best Detailing Brush. Professionals use parts cleaning brushes to detail hard to reach spots all over any vehicle. Traditional brushes are made with heavy wood and metal parts, cheap plastic bristles, and poorly thought out ergonomics. To give detailers the best tools possible, Chemical Guys made The Best Detailing Brush. This new tool combines the best materials, design, and ergonomics to make any cleaning and detailing task as easy as possible. Old brushes use metal ferrules to hold their bristles, but these parts can rust and even scratch and damage painted areas when knocked against them. 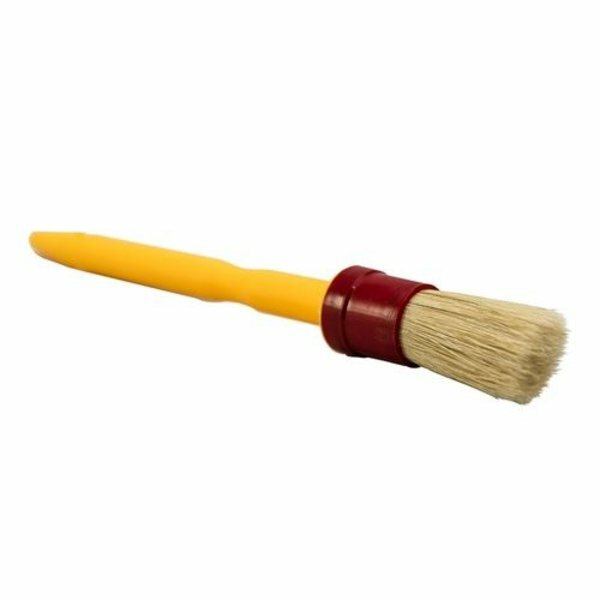 The Best Detailing Brush uses a lightweight plastic handle and ferrule for ease of use with less fatigue, and a softer scratch-free touch if ever accidentally knocked against parts. 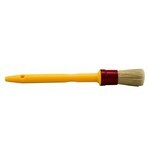 Cheaper brushes use hard plastic bristles that scratch sensitive painted surfaces around cars. The Best Detailing Brush uses all-natural boar 's hair bristles, which are renowned for their rugged chemical-resistant durability, tough cleaning power on grease and grime, and soft touch on sensitive surfaces. The contoured brush handle features a convenient notch for using a short grip with fine control, or a longer grip with more leverage and reach. Make the smart decision and upgrade your detailing arsenal with the Best Detailing Brush. Detailing professionals need the best tools to get the best results. The best tools are often the few that do multiple jobs very well. 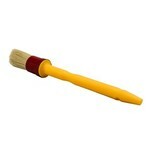 The Best Detailing Brush is the most versatile parts cleaning brush ever designed for detailing. 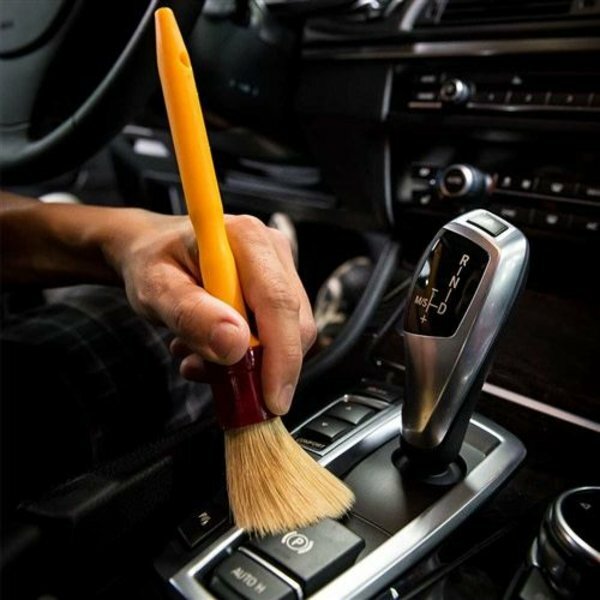 Use the Best Detailing Brush to clean out air conditioning vents, cupholders, leather seats and upholstery, door handles, window switches, and any other hard to reach nooks and crannies on car interiors. The soft boar 's hair bristles won 't damage any sensitive surface found throughout any car interior, including leather, plastic, glass, paint, navigation screens, wood trim, and polished metals. The Best Detailing Brush works great for exterior areas like wheels, lugnuts, brake calipers, exhaust tips, emblems, trunk jambs, engine bays, valve covers, air boxes, batteries, windshield cowls, alternators, and any other parts that are filthy and caked with grime. The durable plastic and natural boar 's hair are chemical resistant and won 't break down after repeated use in extreme conditions. Have one brush just for interiors, and one just for filthy exterior parts to avoid cross-contamination between the surfaces. Don 't settle for second-best; choose the Best Detailing Brush from Chemical Guys. The key to a scratch-free shine is a gentle touch. Poor quality cleaning tools like plastic brush bristles scratch and damage painted finishes, and metal brush parts like bristle ferrules can scratch and chip areas around the vehicle. The Best Detailing Brush is made with all natural boar 's hair bristles and scratch-resistant plastic parts. Boar 's hair is the trade secret for gentle scrubbing and cleaning on any area of a car. The natural hair fibers are chemical resistant, and will not break down, melt, or degrade when used with any Chemical Guys cleaners or degreasers. The durable plastic handle and ferrule are ruggedly built, but are softer than the metal and plastic found all around automobiles. If a detailer ever knocks the Best Detailing Brush into a wheel spoke or door jamb while scrubbing and cleaning, the softer plastic will absorb the brunt of the impact and leave the car 's surface unmarred and undamaged. The Best Detailing Brush cleans away heavy dirt and grime without harming the surface underneath.